Book ChapterDigital resources are stored online in your NSTA Library. A person, place, or thing is what usually sparks those first memorable childhood impressions. Of course, we often do not study our newfound interests from the time of our personal enlightenment to adulthood, but early childhood interests are strong and they can have a powerful hold on us. Children usually show interest in many areas, though one interest usually resurfaces as they get older. Often, it seems this interest--usually one from childhood--is the one that leads to a profession. This free selection from Start Young! Early Childhood Science Activities also includes a Contents, Introduction, and Index section, along with a Quick Reference Chart. This looks like a cute book, just by looking at the cover. I think it'll be a useful resource for me to use when needing to think of science activities. well, it might still be daunting for an early elementary teacher to face science, but the authors have done everything they can to make it work in a regular classroom. The book is presented in a friendly, easy to read layout and the material presented is not intimidating at all. The ideas for science centers are cost conscious and the activities highlight inquiry and the belief that young children are natural scientists. 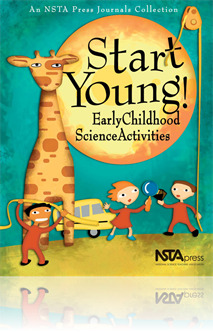 This sample section highlights some of the many useful hints, activities, and thoughts on teaching young children science this book offers. It provides a quick reference chart for standards as well as a great page on how to scaffold students curiosity.